Did you know that after the recent G.R. (Government Regulation) dated 03rd January 2009 issued by the Governemnt of Maharashtra it is now mandatory for all co-operative housing societies, whose members wish to go in for redevelopment to follow certain procedures laid down in this G.R. very stringently, failing which the entire process of redevelopment of their society can fail. As a result of all the above factors there were many litigation’s which were littering up the actually overcrowded courts of law. 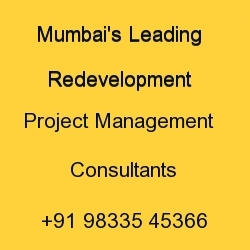 All these disputes could have been avoided if the society had appointed a professionally qualified Redevelopment PMC (Project Management Consultant) to carry out a proper FEASIBILITY REPORT. FEASIBILITY REPORT is a means of determining the existing plot potential after checking all the papers available with the society, vis-a-vis the actual area in possession of the members. The FEASIBILITY REPORT will determine the benefits that the members of the building will get from any developer, in terms of Extra Area, Corpus, Rent & any other benefit. INVESTIGATION- TECHNICAL FEASIBILITY & COMMERCIAL VIABILITY INCLUDING PLANNING). Working out alternative plans for redevelopment of the plot, taking into consideration the latest Municipal Development rules & regulations. Working out the minimum & maximum benefits viable in the project. Laying down the optimum benefits, which can be derived from any developer, including monetary benefit, if any?